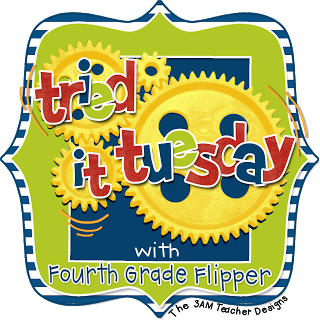 Today, I'm linking up with Holly from Fourth Grade Flipper for her Tried it Tuesday linky! On our team this year we're all about trying new things. One of my favorite new things we've tried is our team Facebook page! It was easy to set up (according to may amazing partner who did the dirty work) and now all the teachers on our team are admins. It's great for quick reminders and updates to parents who already have Facebook accounts. We also had parents sign off on media releases so that we can start photographing students at work and posting "action shots" online as well. So far we've had 35 parents like our page and we haven't even been in school two full weeks! You can set up the account so that parents are not able to post comments to the wall and are only able to "like" photos and statuses. Facebook also lets you know how people have viewed your status which is one of those "nice to knows." Our district and PTO also just went live on Facebook this year as well so now parents can stay connected in multiple ways. But perhaps most amazing of all, my phone knows when I'm on my team page and automatically switches over so that I'm acting as "Team Infinity" and not my personal account... Smart phones are so smart! How do you use social media in your classrooms? Interesting concept. Seems schools are starting to embrace the social media instead of waving sticks at it. Our school just put up a page as well. What a great idea - I like that you can block comments! Great idea! I use Edmodo which is like Facebook, but it's for kids. Parents are able to sign on and see what their child has assigned or been up to. I like Edmodo because the students can't talk to one another unless they post on the wall and respond to a post. I might try a Facebook page in the future. Thanks for sharing! Super idea for your team! I like it! (Of course, it would be something else I'd have to keep up with, but parents would be up to date on everything!) Can't wait to hear more as the year goes on! This is great! I have wanted to use facebook for a teacher page but need to okay it through administration first. They are cautious about that and I'm afraid I would be turned down. I love how yours is a team page!